Summer has finally reached its end. The days of the blazing hot sun are behind us, and the days of crisp autumn air and pumpkins galore are ahead. While the arrival of fall is very welcome indeed for people who are tired of sweating to death in the summer heat, it can also have some adverse effects on your skin. At Rejuvenation Medi-Spa, we’re not having that. Our mission is to help as many people as possible in the Prince Frederick area to feel as beautiful, young, and healthy as possible, and we have some ideas of how you can do that in the fall season. 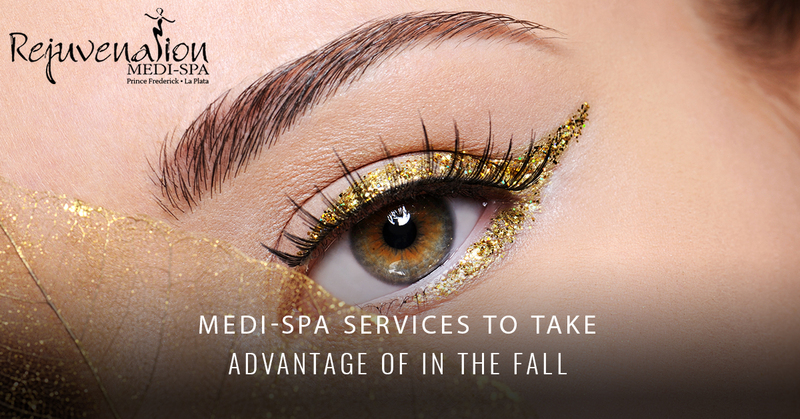 There are several medi-spa treatments that can be a boon to your skin and complexion — here are some services to consider now that autumn has arrived. Although it’s a truly relaxing and wonderful experience, doing all of your tanning out in the sun isn’t the greatest idea due to the excessive exposure to UV rays. In the fall, however, it becomes even less viable, since the sun isn’t always accompanied by delightful warmth. You’ve no doubt experienced countless fall days in Maryland where the sun shines bright, but the crisp bite of cold still fills the air. Fall is just more chilly than summer is, so your days of glorious sun tanning might be over for this year. Fortunately, spray tanning is an excellent solution if you still want to remain as a bronze goddess year around. Spray tans, when professionally applied, look completely authentic, far from the superficial look that’s often a result of consistent tanning bed usage. The best thing about spray tans is that they’re completely safe, so you won’t be left wondering if you’re one step closer to skin cancer like you often are when you allow yourself to get baked by the sun. Fall isn’t too generous to your skin for a few different reasons — sudden temperature changes can result in your capillaries expanding and your veins rupturing, resulting in red inflamed skin. The decrease in humidity can dry your skin out, resulting in dryness, cracking, and irritation. When we take hot baths and showers to combat the cold, we often wash away the skin’s protective layer. All of these things are a nuisance to your skin health, and that’s why it’s good to have your skin in the healthiest state possible as you go into fall. Microdermabrasion is a procedure that keeps your skin healthy and youthful. In a nutshell, microdermabrasion is a treatment in which a medical spa professional removes the top layer of your skin, which consists of a tiny layer of dead skin cells. The accumulation of these dead cells is so slow and gradual that it’s hard to notice they’re ever there, but when they’re professionally removed via microdermabrasion, you’ll find the difference feels like night and day. The bottom line is that it’s good to enter into a new season with skin that is clean, healthy, and freshly rejuvenated. Microdermabrasion does just that, giving your skin a “clean slate.” This isn’t permanent, as dead cell accumulation is an inevitability, but it will keep you good for about thirty days. We have many clients that come in for microdermabrasion every single month because it leaves them feeling so renewed. There are all kinds of treatments out there to improve the volume and look of your eyelashes, and it’s possible that you’ve tried many. Many of these procedures are frustrating in practice and often leave you wanting. That’s why you should consider coming in for an eyelash lift, which is a simple 90-minute treatment that leaves your eyelashes turned upwards, giving them more length to work with and giving the appearance of more volume. Many people prefer eyelash lifts as their go-to treatment, because all it does is reform your existing eyelashes to make them more appealing. There are no fake eyelashes here! It’s a simple and effective way to make the most of what you already have, and you’d be surprised of what your eyelashes are capable of when they’ve gotten our keratin treatment. So, what does this have to do with fall? The answer is easy — Halloween costumes! It’s not uncommon for fictional characters to have exaggerated eyelashes, and making a fancy costume might be the perfect excuse to go all-out on your own. That shouldn’t be the only reason you get one, since eyelash lift treatments last for up to eight weeks. But if you’ve been wanting to do something to your eyes, and you have a cool costume in mind, it might just be the justification you need to go in for a treatment. Whatever your reason is, there’s never a bad time to visit your local medi-spa. We’ve listed just three of our services here, but in reality, we have 21 different spa and medi-spa procedures that will help any client to feel completely rejuvenation. And that is exactly why we call ourselves Rejuvenation Medi-Spa — there’s no way to feel more renewed than professional spa treatments, and we love seeing how much more relaxed and happy our clients are when they walk out of our establishment as if they’ve been born anew. The fall takes its toll on your skin, and there are plenty of reasons to justify visiting a spa as Halloween draws near. But ultimately, spa treatments can be valuable at any time of the year. Looking to get a facial, or get rid of your pesky body hair with laser hair removal? Ever been interested in trying chemical peels, kybella, or dermal fillers? Want to make long-term changes with botox or tattoo removal? No matter what you want to do, we’ve got you covered. If you’re in Prince Frederick, La Plata, or any of the other surrounding regions in Maryland, stop by today, and feel free to contact us if you have any questions! We’ll be there any time of the year.